It's called "Heavy Rotation" and it's one of AKB48's most popular videos of all time. And what I posted was somewhat nice compared to a lot of the rest of the video. "Sayonara Crawl" is also a good AKB48 video. But my favorite is "Fortune Cookie". 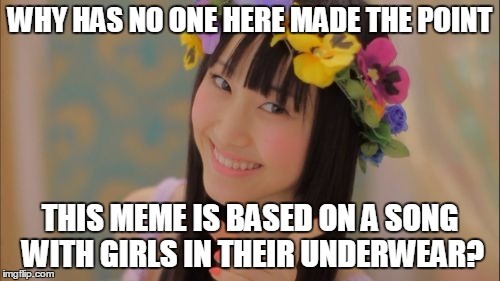 WHY HAS NO ONE HERE MADE THE POINT; THIS MEME IS BASED ON A SONG WITH GIRLS IN THEIR UNDERWEAR?